Many pubs in Paris look like one another, and there are even more and more chains of pubs reproducing a same décor or atmosphere. This is not the case with Auld Alliance. 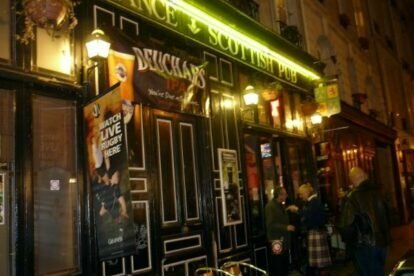 Located in the “lower” Marais (quieter than the very busy Marais, North of Rue de Rivoli), this pub has a strong personality, maybe because it’s one of the rare Scottish pubs in Paris. For that reason, it’s a good place to taste a great range of whiskies, or to celebrate the Burns night (January 25th). The atmosphere is generally quite cosy, and it’s one of my first choices when I want to go for a pint and want to be able to talk without shouting. But it can also get very crowded and loud for sports events like the Six Nations (rugby) or the Old Firm (football derby between Rangers and Celtic). Watching a rugby match between France and Scotland here is a unique experience, the crowd being generally around 50/50, “Allez les Bleus” choirs and blue jerseys competing with bagpipes and kilts. By the way, the Auld Alliance which gives its name to the pub is a historical agreement between Scotland and France in order to fight against their preferred common enemy… guess who! That’s probably why Scottish expats and French regulars perfectly manage to mix in such a friendly and non serious atmosphere.